Nick Maaco and Adam Boeselager, co-founderes of Southtree, stand in their new downtown production office at 1404 Cowart Street. The duo, who founded the company in 2001, have expanded to 40 employees and 8,200 square feet of production space. Chattanooga-based Southtree has added a second location in Chattanooga, part of an non-stop expansion for the growing company that continually added more staff and space since its founding in 2001. 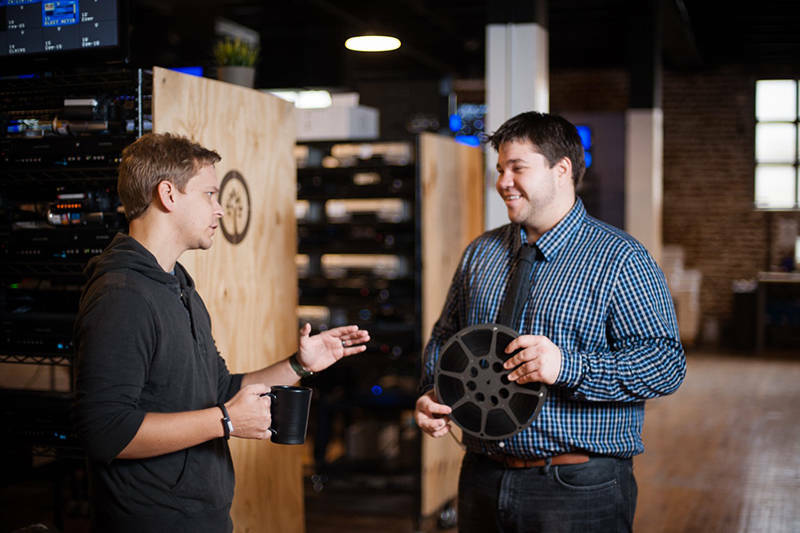 The company, which helps digitize old tapes, film, slides, photos and audio, will more than triple its current 2,500-square-foot space by adding a production studio at 1404 Cowart Street. Last year, the Southtree preserved 100,000 home movies and 600,000 photos, and Adam Boeselager, founder and CEO, expects to increase that volume. "This new space will really help us meet customer demand," he said. The company now has about 40 workers in downtown Chattanooga, where the company has committed to stay for the present, said Nick Macco, founder and chief marketing officer. "We love our city, and want to be able to help in its revitalization," Macco said. "We want to be a part of keeping and attracting jobs in the city."